The origins of dendrochronology can be traced back to 1894. A. E. (Andrew Ellicott) Douglass (July 5, 1867, Windsor, Vermont – March 20, 1962, Tucson, Arizona) was an American astronomer. He discovered a correlation between tree rings and the sunspot cycle. Douglass founded the discipline of dendrochronology, which is a method of dating wood by analyzing the growth ring pattern. He started his discoveries in this field in 1894 when he was working at the Lowell Observatory. During this time he was an assistant to Percival Lowell and William Henry Pickering, but fell out with them, when his experiments made him doubt the existence of artificial “canals” on Mars and visible cusps on Venus. After the founding of Lowell Observatory in 1894, Douglass stayed on for seven years as Percival Lowell’s chief assistant. During this time, he provided a great quantity of data regarding Mars which Lowell used to support his theories about the existence of an intelligent, canal-building Martian civilization. Lowell and Douglass, however, clashed several times over Douglassís opinion that Lowell used data selectively (and thus unscientifically and inaccurately) to prove his theories. Lowell eventually lost patience with Douglass and sacked him for this opinion in 1901. However, somewhere along the line, dendrochronology was assimilated into the Earth Sciences where it now specialises in Lacunar Amnesia [aka ignoring the gaps]. Dendrochronology or tree-ring dating is the scientific method of dating based on the analysis of patterns of tree rings, also known as growth rings. Dendrochronology can date the time at which tree rings were formed, in many types of wood, to the exact calendar year. This has three main areas of application: paleoecology, where it is used to determine certain aspects of past ecologies (most prominently climate); archaeology and the history of art and architecture, where it is used to date old panel paintings on wood, buildings, etc. ; and radiocarbon dating, where it is used to calibrate radiocarbon ages. In some areas of the world, it is possible to date wood back a few thousand years, or even many thousands. Currently, the maximum for fully anchored chronologies is a little over 11,000 years from present. 1) Each year trees create a layer of new wood under the bark i.e. a tree ring. 2) Within restricted geographical units, trees of the same species growing at the same time will show similar trends in tree-ring growth. Dendrochronology or tree-ring dating makes use of the annual pattern of growth shown by most tree species in temperate regions. Each year trees such as oak put on a layer of new wood under the bark. The thickness of that layer – the tree-ring – will depend on various factors. The genetic make-up of the tree and the type of soil in which it is rooted both play a role, as do other environmental factors, but generally it is climatic factors that determine whether the ring will be wide or narrow. Conditions favourable to growth will result in a wide ring; unfavourable ones will produce a narrow ring. Therefore, examination of the annual growth rings of a tree will reveal not only its age, but also the fluctuating climatic conditions during its lifetime. Within restricted geographical units, trees of the same species growing at the same time will show similar trends in tree-ring growth. This can be seen by measuring the widths of the rings from different trees, plotting them against time in years, and superimposing the plots, known as tree-ring curves. Trees in the same woodland will show a high degree of agreement in year-to-year variation over long periods of time. The latter is most pronounced in samples from the same tree and this very strong similarity can sometimes be used as a means of determining when two timbers have been cut from a single tree. a) A very narrow ring can be difficult to identify. b) Wide spring wood could represent two rings rather than one. c) Disease and frost damage may impact tree ring growth. Accordingly, everything in dendrochronology is subject to [human] interpretation and [human] misinterpretation. Therefore, starting from the very beginning, the objective is to create a Site Master by collecting tree ring samples [from the same species] for a specific geographical area. The Site Master is then slowly accumulated by measuring the tree rings in each sample where each sample can be precisely and accurately dated because it came from a) a living tree or b) a dead tree where the date of death is know. Ring widths are measured, generally to an accuracy of 0.01mm, on a travelling stage. The stage is connected to a microcomputer, which uses a suite of specially written dendrochronology programs (Tyers 1997). Other laboratories either use commercially available software or have developed their own. The wood sample is viewed through a low-power binocular microscope with the crosswire aligned with the start of the first ring. The stage is moved along until the crosswire reaches the start of the next ring, after which a button is depressed and the distance moved is entered into the computer (usually done using the left mouse button). To make it easier to recheck the measurements, every tenth ring is marked with a dot using a needle (wet samples) or felt tip (dry samples); every 50th ring has two dots, and 100th three dots. Thus, for each sample, a Tree Ring Curve is produced that plots the tree ring width by year. 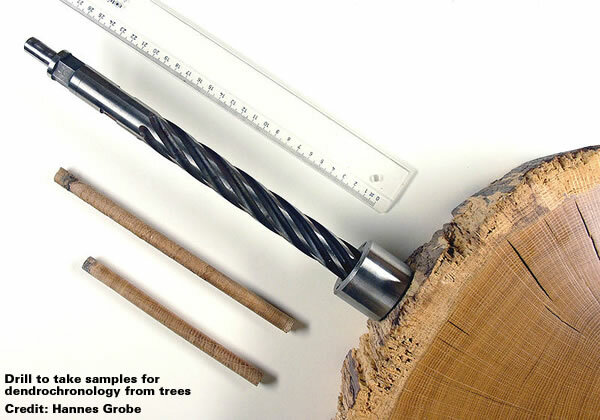 However, if there are insufficient tree rings in the sample then the sample should be discarded because it is “considered unsuitable” for further [statistical] processing because the tree ring pattern is unlikely to be “unique in time”. Core samples with less than 50 rings are considered unsuitable. The number of annual rings can also be a limiting factor. The success of dendrochronology depends on a ring pattern being unique in time so that a particular ring pattern should not be repeated at any other period of time than the one over which the parent tree was growing. This is generally true for ring sequences over 100 years long but is less so as the number of rings decrease. Samples with fewer than 50 rings are therefore usually rejected, although where there are many samples per structure, particularly if bark edge is present, those with 30 – 50 rings might be datable (see the example from Fiskerton in section 1.5.1). Ring patterns with fewer than about 30 rings are definitely not unique and should not be used for dating purposes. (Mills 1988). Additional subjective assessments help ensure “ring problems” do not bias subsequent [statistical] processing. It is usually only necessary to measure oak samples once but it is imperative that a note is made during measurement of any ‘problem rings’. This might be where rings are very narrow or where wide spring wood could represent two rings rather than one. In some cases, the boundaries of the ring are so problematical that it is better not to measure them but to make a note of approximately how many unmeasured rings have been omitted. If the problem rings are in the middle of a sample, it is sometimes possible to measure the sections to either side of the problem and date the two sequences separately. Any anatomically abnormal rings should also be noted during measurement since this may be indicative of environmental effects such as frost (eg Fletcher 1975; LaMarche and Hirschboek 1984). The following image shows two Tree Ring Curves that could be considered candidates for inclusion in a Site Master for oak trees in Quendon, Essex. These two Tree Ring Curves reveals a lot about reality and the art of dendrochronology. i) Perhaps the most important point is that although the Tree Ring Curves have similarities [and points of commonality] they are most definitely not identical. ii) The 76 year period [1985 minus 1909] of the Tree Ring Curves include only three periods of close visual alignment [in image a)]. These alignments occur around growth minima: 1921, 1934 and 1976 [with intervening gaps of 13 years and 42 years]. This indicates that attempting to match Tree Ring Curves of 50 years duration can be tenuous and that Tree Ring Curves should [ideally] be of 100 years [or more]. iii) There is definitely artistry involved in the presentation of these Tree Ring Curves because the logarithmic vertical scale visually minimizes the difference in the tree ring widths. iv) The artistry includes a subtle switch in the colour scheme [in image b)] after the 1968 convergence point. This technique is very useful if you wish to minimize [or hide] the asymmetry in the data. This artistry is further enhanced by removing the scale text from the vertical axis. The process of synchronising two Tree Ring Curves is known as crossmatching or crossdating. It should produce only one true position of match. Although crossmatching shows up best between trees from the same site, similarity in ring pattern can also be seen between trees from different woodlands, particularly if a site master curve (made up from a group of trees from each woodland) is used. Most tree-ring laboratories use a combination of three methods to ensure reliability: visual matching, statistical tests, and replication. All these methods are independent of external dating evidence such as architectural styles or pottery types. Ring sequences within a site or structure are first crossmatched before being combined into a site master. When all the samples have been crossmatched the Site Master is usually produced by simply averaging the tree-ring widths for each year. Master curves summarise the information present in the individual matching ring sequences by enhancing the climatic signal and depressing the background noise from the local environment of the trees. A match is therefore more likely between two master curves than between sequences from two single samples from different sites. Masters can be constructed in several ways (Baillie 1982, 86). The simplest method is to sum the ring widths at each year and divide by the number of samples. The ring width data can also be ‘smoothed’ or ‘detrended’ before averaging them by fitting, for example, a five-year running mean or an exponential curve to produce a series of tree-ring indices. This has the advantage of preventing the over-representation of the wide-ringed samples at the expense of those with narrow rings. The decision whether or not to detrend, and the choice of filter, varies from laboratory to laboratory. This averaging process allows dendrochronologists to progress to the next layer of abstraction which is based upon crossmatching Site Masters so that they can construct a Chronology that spans a greater amount of time. In this way, crossmatching can often be obtained over considerable distances, such as London to Belfast, Sheffield to Exeter, and even Worcester to southern Germany. Obviously, the size of your Chronology determines your status and prowess. This is where Lacunar Amnesia becomes very important because dendrochronologists specialise in Bridging the gaps between Samples and/or Site Masters and/or Chronologies. Bridging is simply based upon finding a Sample or Site Master or Chronology that crossmatches the two sides of the problematical gap. Whether the Bridging is valid [or inappropriate or tenuous or bogus] depends upon the knowledge and integrity of the dendrochronologists involved. This is a particular issue when the Bridging crossmatches different species or diverse geographic areas which are otherwise unconnected. There are now many long oak chronologies throughout Europe. The Northern Ireland chronology, for example, goes back to 5452 BC (Brown et al 1986; Pilcher et al 1995), while a German sequence from the Rhine area extends back to 8480 BC (M Spurk and M Friedrich personal communication May 1997). Other species have also been used for dating purposes, but the potential of non-oak species for dating is only now beginning to be developed in Britain. In England, over the years, many regional sequences of oak have been constructed. These were initially dated by bridging them with chronologies from Germany and Ireland. Given the multiple layers of selection, averaging, abstraction, bridging, blending, interpretation, regional homogenisation, species mingling and statistical manipulation that are involved in a Chronology it is doubtful whether any Chronology is meaningful or statistically valid. Gallery | This entry was posted in Catastrophism, Dendrochronology, History. Bookmark the permalink.